This recipe for Apple Cinnamon Crock Pot Oatmeal is so awesome that all four of my kids (and my hubby) lick the bowl clean. Seriously. And when it’s cold outside, there’s nothing better than warm apple cinnamon oatmeal to start the day! 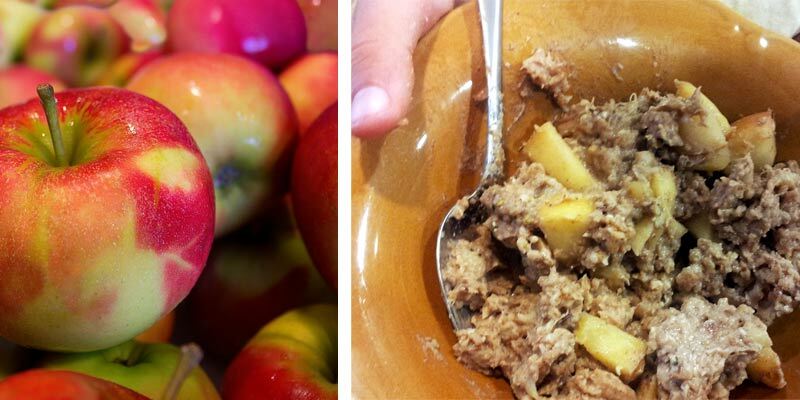 I also love this easy crock pot oatmeal recipe with apples because it comes together quickly (you can prepare this crock pot oatmeal overnight), making this yummy breakfast recipe also one of those quick and easy breakfast recipes for kids. Hurray for fast and tasty breakfast recipes for those extra busy mornings in the fall! P.S. Here’s a list of other great gluten free fall recipes for families. Scroll down to see the recipe for this amazingly flavored (and easy-to-make) apple crock pot oatmeal breakfast that will have your family cheering too! This crock pot oatmeal recipe is also super easy since the Crock Pot does all the work! 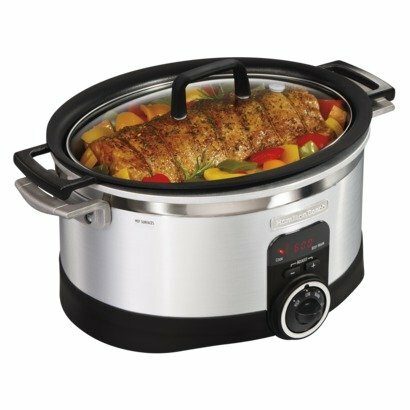 (Here’s my favorite Crock Pot… it’s very versatile for all kinds of dishes because you can use it on the stovetop as well!). 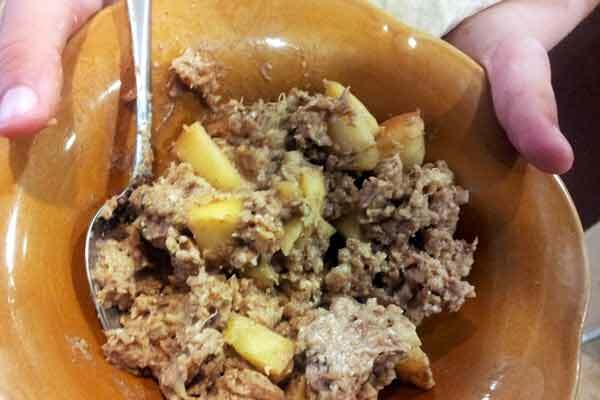 How does this crock pot oatmeal with apples taste? This fast and easy breakfast recipe for kids is creamy but still a little chewy with just the right combination of spice and sweetness. And of course it’s dairy free, gluten free and processed sugars (and whatever else you might find in those odd little oatmeal packets). And did you know all this great stuff about the science-backed health benefits of apples? 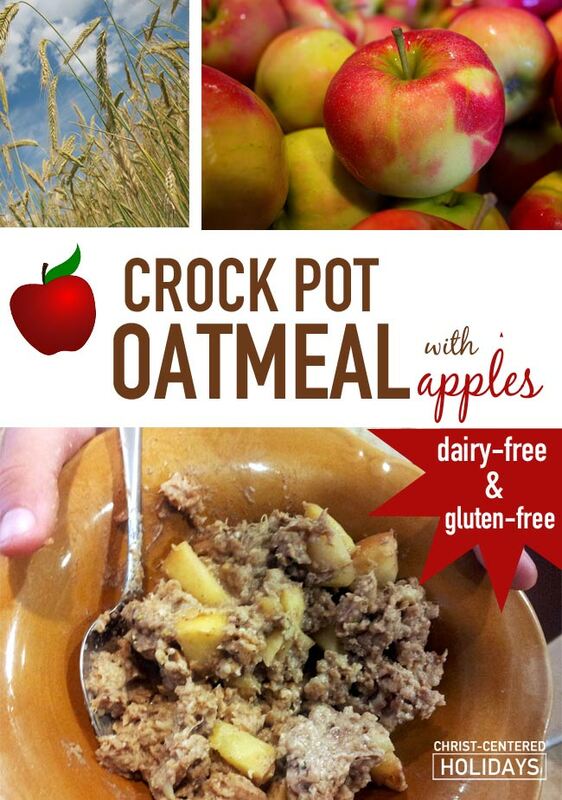 I can’t wait for you to try this apple crock pot oatmeal recipe with your family! You’ll love this wonderful way to say hello to fall! Perhaps it goes without saying, but to make Apple Cinnamon Crock Pot Oatmeal you need… a Crock Pot (an electronic slow cooker). Maybe you already have a crock pot, and if you do, that’s awesome! But if you don’t have a crock pot (or if your crock pot is from the 1970s and could use a little updating), I wanted to share with you my favorite slow cooker model since it makes slow cooker recipes really simple. I love this model because you can heat the insert on the stovetop! That means that if you want to brown meat or vegetables before the slow cooking process (searing meat and veggies brings out the flavor), then you can simply move the insert to your stovetop and sear away. It’s also great to have a stovetop-friendly slow cooker insert because you can easily re-heat crock pot recipes like this crock pot oatmeal recipe with apples (if you’re lucky to have any of this yummy breakfast recipe left over!). Anyway, if you need a slow cooker (and what busy mom doesn’t?!) this is the model I’d highly recommend. Add all ingredients (except toppings) to the slow cooker. Mix well. Cover and cook on low for 2-3 hours or high for 1.5 to 2 hours. Smell the deliciousness simmering away. Wake up (or come home to) the amazing smell of cinnamon, vanilla… you know, the smell of totally rockin’ oatmeal. Spoon the deliciousness into your bowl and try not to make a pig of yourself in front of your kids. And of course, if you love this crock pot oatmeal recipe, don’t forget to pin and share it so others can enjoy this quick and easy breakfast recipe too!